S.S. Bon Voyage is scheduled to emerge in Spring 2019 after previously sailing as River Royale. Being one of the most technologically advanced ships on the rivers is a title that S.S. Bon Voyage is proud to boast. Some of these advances include the ability for top deck items to automatically lower for locks and the feature of a jacuzzi tub in the rear of the ship. 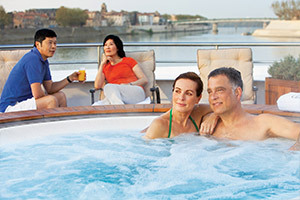 The jacuzzi tub serves as both a welcome relaxing spot to passengers and a technological advance that helps muffle vibrations and create an even quieter and smoother trip down the river. S.S. Bon Voyage allows passengers to enjoy all that the small European river towns how to offer without having to sacrifice the luxury and joy of cruising. Featuring customized free tours at every port, as well as enhanced "for-fee" tours, there will never be a lack of something to do aboard S.S. Bon Voyage. 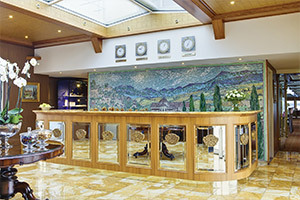 Itineraries include cruises down the Burgundy and Provence as well as a Grand France tour. 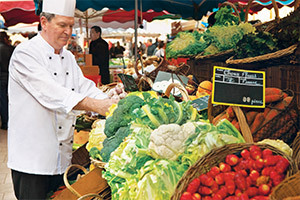 All itineraries include distinct excursions like museums, castles, wine tastings, and of course market shopping. One of the main highlights of a S.S. Bon Voyage cruise would have to be the food. Expertly trained chefs do their very best to bring all the flavors and aromas of the French country-side to your plate every night. Not enjoying the local cuisine? No need to worry as more traditional dishes can be custom ordered at every meal to please the palate of even the pickiest eater. And finally you cannot have luxury without wine, all meals will be expertly paired with local wine to complete the total French immersion. All river cruises aboard S.S. Bon Voyage feature some of the most exciting shore excursions to be found in Europe. Each itinerary features multiple ports of call at quaint European towns that define the romance of old-world Europe. Guided or un-guided tours, the choice is yours. Trek out on your own or fall in line with a guided tour by local experts. 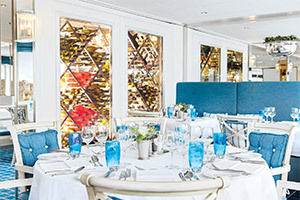 A main highlight of sailing on S.S. Bon Voyage is the culinary experience. Taking all the best flavors and dishes of every single stop along the way, there will be no shortage of excitement for your culinary appetite. Expertly trained staff offer many dishes every night for passengers to choose from as well as wonderful wine suggestions that highlight the local aromas of small town France. Low Price Guarantee on all S.S. Bon Voyage Cruises! Book any S.S. Bon Voyage river cruise with us and you'll get the best deal possible, regardless of the ship or sail date! 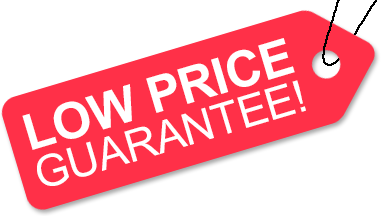 Because of our "Low Price Guarantee," nobody beats our S.S. Bon Voyage cruise prices, so look around and you're sure to find the best S.S. Bon Voyage cruise deal possible when booking with us! Book a Uniworld cruise with us and get a Gift Card for the store of your choice. The value of the Gift Card depends on the particular cruise and accommodations you book. Gift Card values are listed on Step 3 of the online booking process. All scheduled airport transfers included. 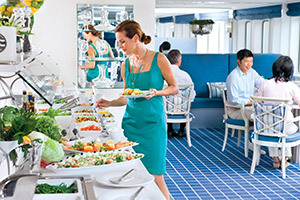 Inclusive onboard dining and entertainment, and select complimentary beverages. A variety of personalized excursions, led by English-speaking local experts. Excursions created exclusively for Uniworld guests. 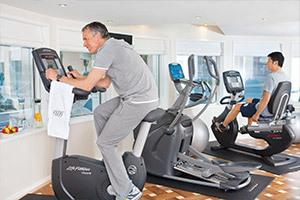 Well-equipped onboard fitness center, offering excercise and wellness clases (lead by certified onboard wellness instructors in Europe). Bicycles and Nordic walking sticks for onshore use. 1 Gratuities are not included for Russia & Egypt itineraries. For Asia itineraries, only gratuities for the local land experts and drivers during excursions are included. 2 Excludes Russia, Portugal and all non-Europe itineraries. 3 Service may be briefly interrupted in remote areas, while sailing, or moving through locks. Certain restrictions apply. Select benefits will not be available on every ship, and may be withdrawn or changed by Uniworld at any time. Ever very effort has been made to produce this info accurately; we reserve the right to correct errors. We do not charge booking fees on any cruises! You're sure to enjoy an affordable S.S. Bon Voyage cruise when booking with us! Our special offers on S.S. Bon Voyage cruises may not be combinable. Certain restrictions apply to each offer. Click a price below to view the S.S. Bon Voyage cruises during that month in that destination. Grand Suites can fit up to 2 guests. The Suite includes all amenities listed above. This accommodation can fit up to 2 guests. The Suite includes all amenities listed above. Butler service is not available for this suite. These accommodations can fit up to 2 guests. French Balcony cabins include all amenities listed above. These accommodations can fit up to 2 guests. Category 2 cabins include all amenities listed above. These accommodations can fit up to 2 guests. Category 3 cabins include all amenities listed above. The deck plans of S.S. Bon Voyage provided on this page are subject to change. We reserve the right to correct errors. Please verify all information with Uniworld directly.